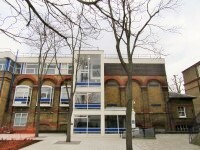 Related link Advice and Counselling Services. Related link Occupation Health Services/Student Health Services. This information is for the entrance located off Geography Square. The width of the ramp is 149cm (4ft 11in). 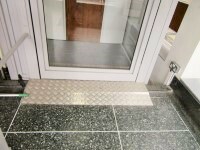 Tactile paving is located at the bottom of the steps only. 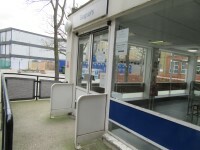 You are on Outside Access (Advice and Counselling Service). Skip to the next section. 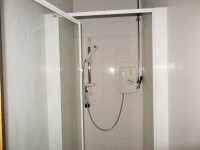 There is an intercom at the second set of doors that is too high for easy reach. 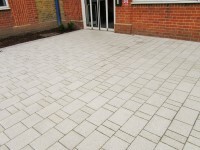 You are on Outside Access (Occupational Health Service and Student Health Service). Skip to the next section. You are on Entrance (The Bancroft Building). Skip to the next section. This information is for the entrance located on the second floor of the building. 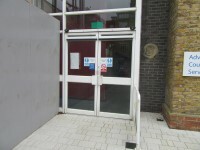 There are three sets of manual, heavy, double doors between the lift and this entrance. 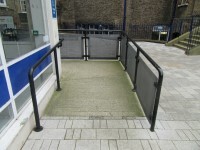 The ramp/slope is located between the second and third entrance doors. 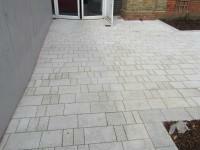 The ramp/slope bypasses the steps. There is a third entrance door. 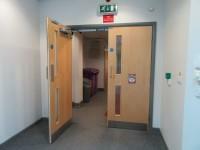 They are heavy double doors that open towards you and have a width of 156cm. You are on Lift (Drapers Lecture Theatre). Skip to the next section. 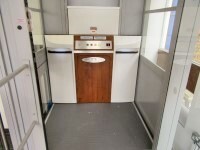 The dimensions of the lift are 142cm x 96cm (4ft 8in x 3ft 2in). 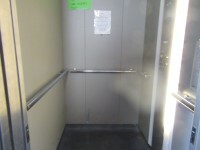 The lift door opens automatically towards you. 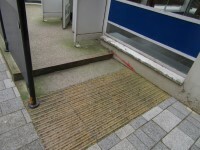 There is a small ramp to access the lift. 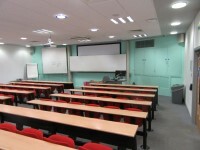 You are on Lecture Theatre(s) (Drapers Lecture Theatre). Skip to the next section. 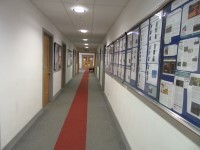 The corridor outside the lecture theatre(s) is not sufficiently wide enough (150cm+) to allow wheelchair users to pass. The designated spaces for wheelchairs users are located in the middle row(s). 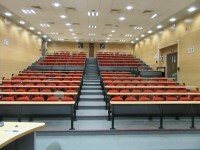 The speakers area is located at the bottom of the staggered seating. 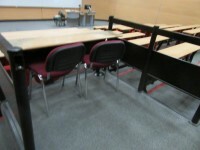 The clear floor space beneath tables in the lecture theatre(s) ranges between 70cm and 70cm. 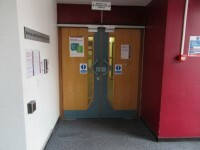 Step free access to the lecture theatre can only be gained via a platform lift. Please see the seperate section for more details. 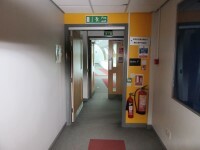 There are manual, heavy, double doors to access the stairwell on the first floor and on the second floor. 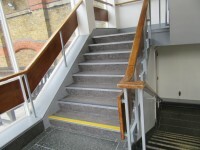 These stairs also lead down to the Drapers lecture theatre. 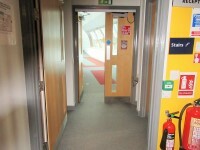 There are manual, heavy, double doors to enter and exit the lift lobby on the first floor and on the second floor. 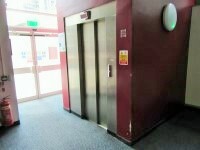 The lift is approximately 3m (3yd 10in) from the Advice and Counselling entrance. 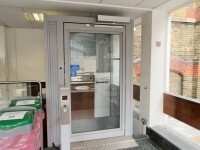 The dimensions of the lift are 96cm x 134cm (3ft 2in x 4ft 5in). 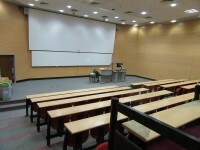 You are on Drapers Lecture Theatre. Skip to the next section. 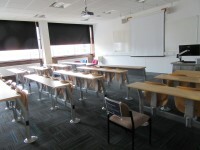 There is level access to the middle of the lecture theatre seating via lift. 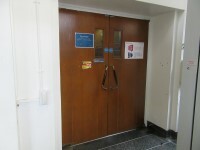 The entrance to the theatre is through double doors that are pull to open with a width of 160cm. 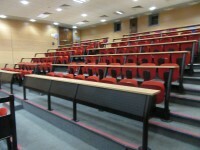 There is designated seating located in the middle of the lecture theatre. The steps in the lecture are medium and have good colour contrast. 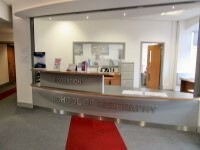 You are on Reception (School of Geography). Skip to the next section. The desk/counter is 50m (54yd 2ft) from the main lift. 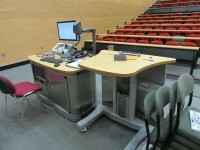 There are Q-Review lecture recording systems in rooms 126, 220 and 226. Room 126 has steps access to seating at the rear of the room. 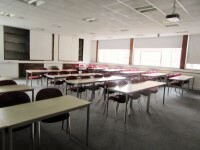 Room 220 has designated seating available (as shown in photograph 3). 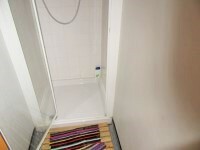 You are on Standard Shower (Staff). Skip to the next section. There is an easy step to access this facility. 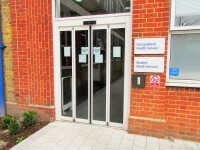 The nearest accessible toilet is located in Occupational Health Service/Student Health Service or the Bancroft Building. Please see relevant guide for more details. 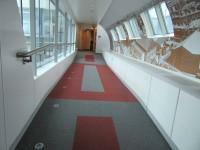 There are male standard toilets facilities on the ground floor and the second floor. 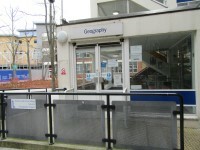 The toilet surveyed is located on the Ground floor through the Occupational Health Service and Student Health Service Entrance. 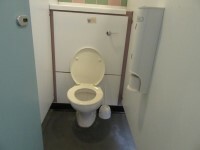 The standard toilet surveyed is approximately 7m from the Occupational Health Service and Student Health Service Entrance.